Of all deities that can be found throughout the ancient world, none has inspired the human imagination and curiosity more than the concept of the Feathered Serpent from ancient Mexico. The reason for this curious phenomenon would of course be obvious. The elemental concept of the Feathered Serpent is wholly a human conceptualization of nature, consisting of two opposites converging that amounts to a being that was at first a (Feathered) Bird, and then also finally a Serpent. The question then, and which has haunted the contemporary mind for so many decades now is: “How did this Serpent ever become feathered?” There almost seems to be a process involved, now forgotten over the long era's of time since this deities inception, which came shortly after the birth of Mesoamerica perhaps now almost 3,000-years ago. Furthermore, the image and iconography of the Feathered Serpent is in itself intriguing, as the image seems to conjure up so much uplifting emotion, and flights of fancy that relate to the notion of a transformation of the mind, within the environmental entrapment’s of matter that finally congeal pointedly to emerge in the realization of an ultimate oneness that is found between the opposite forces of matter the (Serpent), and the mental spirit or the (Feathered Bird). Therefore, with this intriguing symbol we are summoned to seek the psychological transformation that we innately sense as our own personal right, and as our ultimate human duty. The intuitive conclusion is that Quetzalcoatl as the Feathered Serpent, is a symbol of the spiritual enlightenment that is found and discovered through the convergence and full consolidation of life's lessons, which are to be perceived within the infinite potential of the moment at hand. To this degree, the Feathered Serpent is indeed a symbol of personal fulfillment through the endorsement of transformed perception – thus the implication of this deities resplendent feathers that grace the body of the symbolically rejuvenated reptile. The very word “Quetzalcoatl,” is a joint Nahuatl word meaning, Quetzal (Bird) and Coatl (Serpent). However, because the deity in concept is older than the Nahuatl language itself, it has of course then taken on other names throughout the time of Mesoamerican history. For that matter, the deity is a cultural inheritance that was for the most part, previously derived from the southeastern regions of the rainforests where the ancient Olmec and Maya had once dwelled. 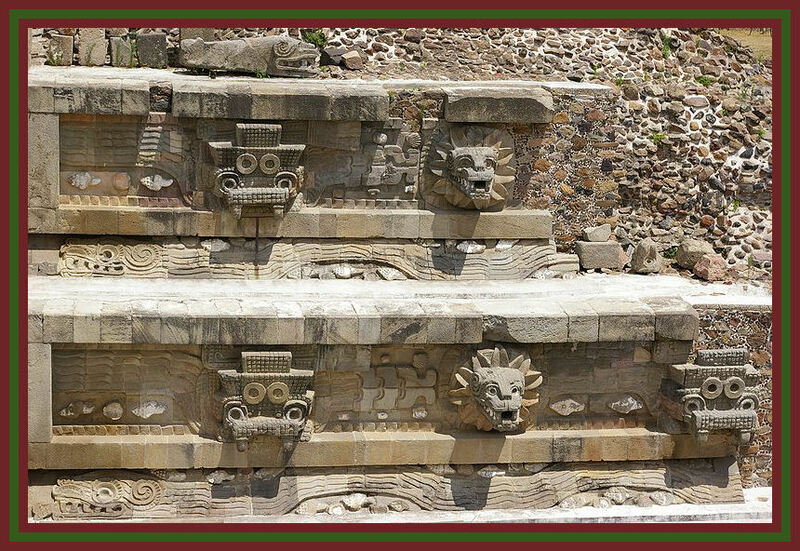 One of the oldest monuments dedicated to the likeness of the Feathered Serpent, in fact comes from the rainforest region of La Venta, which displays a priest involved in a ritualistic adornment, and who almost seems to be coiled and emerging, as he is pulled upwards along with the large beaked serpent whose head travels up towards the heavens with a characteristic crest of feathers indicating its transformed status from one being into another. A being which like a cloud emerges from the lower worlds of water, and evaporates up into the higher worlds of the air through the dynamic element of fire. Indeed, the flight of clouds thru the air is in reality one of the original and preeminent symbols of the Feathered Serpent, since its initial conceptualization with the original agricultural societies within Mesoamerica. One of the earliest depictions of Quetzalcoatl, as "The Feathered Serpent," from the ancient Olmec site of La Venta. The deity as a full fledged concept is plainly pronounced with the depiction of a crest of feathers atop the serpents head, which itself has been endorsed with the beak of a bird to indicate the transformed status of the zoological phenomenon that bridges the opposites of the higher, and the lower worlds as a indication of the precipitation and floral bounty found throughout the rainforests. The human being at the center of the stela does not necessarily itself have to represent Quetzalcoatl as the human archetype found in later representations throughout ancient Mesoamerica, however it could very well be just that, implying that the figure is beginning a trip into the underworld via the path of the Feathered Dragon. In the premier agricultural realm of Teotihuacan, we find many iconographic displays of this deity's image strewn all throughout the ancient city. This is especially prevalent upon the frontal decoration of what is presumed to be the temple of this deity at Teotihuacan, where carved serpent heads with crested feather collars alternate with another deity that is presumed to be an ancient version of the goggled eyed rain god later known as Tlaloc. 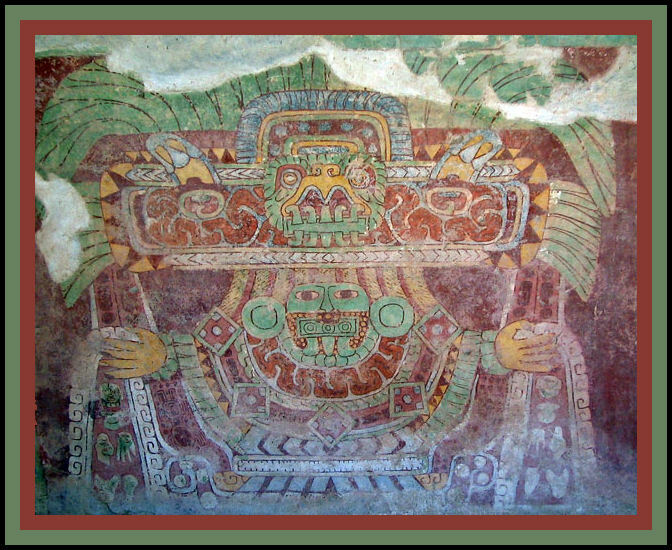 This ancient Teotihuacan version of Tlaloc was previously in those times a war god, whose frightening characteristics of thunder and lightning no doubt then colored his later emergence as a war god, right along with the multitudinous drops of rain that fell like arrows across the land. This is despite this deities previous positioning as an agricultural god, which he would by default naturally retain along with the attractive company of the Feathered Serpent as a companion deity; and or, as an avatar as some prefer to see these two separate deities as operating within the realms of rain, water, and fecundity. The ancient Teotihuacan war god or "Tlaloc," was first and foremost a solar agricultural deity, which was responsible for bringing the rain waters from within the underworlds of the mountain caves out into the open air in the form of the clouds that then became the much needed and desired precipitation. The legacy of this ancient deity displays clearly the iconographic marks of a bird deity, which are plainly displayed with the curious "goggle eye's," so common in many other ancient Mesoamerican deity's of rain. The goggle eyes are apparently a symbol of the midnight owl who's flight into the underworld darkness was designed to retrieve the the essence of the water serpent found in the deeps of the mountain caves. As the bird of midnight (the sun) obtained the water serpent, and then rose once again with the serpent within it's beak, the two beings then merged as one to become a Feathered Serpent, or symbolically the form of a rain cloud also represented by the form of the Milky Way. This Teotihuacan mural form the De Young Museum collection clearly shows the iconographic mark of the owl with the "owl claw," that emanates outward from the headdress to the lower right. This is undoubtedly the symbol of the midnight sun with its duty of retrieving the water serpent. The pinnacles within the headdress are apparently snow capped mountains, which contained the watery resource. The difference which lies between the two deities of Tlaloc and Quetzalcoatl is an important question to explore, since they both pertain to the generation of rain storms, and to the abundance of agricultural greenery that is produced therein. However, as both god heads refer to the characteristics of the seasonal onslaught of life giving rain storms, it was the symbol of Quetzalcoatl as the Feathered Serpent that would eventually come to embrace the image of the shifting winds, and even more specifically, to the hurricanes that visit the coasts from the immediate seas where these cyclones are born. Tlaloc on the other hand, is the inland storm whose collective eminence is born from the peaks of mountains where rain clouds gather; or from the massive mountainous white thunderheads that rise from the inland desert floor. In any case, it seems that the Tlaloc rain god is to be understood as the elder deity, while the Feathered Dragon is to be understood as the cultural aftermath that really is in essence finally an avatar or “reincarnation” of Tlaloc, just as would be the case in: Tlaloc as (Mountain Water Source), and Quetzalcoatl as (Wind and Rain Cloud). Once again however, it would be the difference between the inland environments, and the outward designations of the watery sea's that should ultimately create a diversion between these two companion deities from an earlier historical standpoint. For that matter, Quetzalcoatl would have previously, early on retained a relationship to the ancient primordial water goddess; the one who we would come to know thru the Nahuatl name as the “Precious Skirt of Jade,” Chalchihuitlicue. This feminine water source deity would be the earlier counterpart of the upcoming masculine Quetzalcoatl, who would later become by reputation as a rain maker, also the male god of water. Finally, in the latest version of Aztec mythologies we see Tlaloc and Chalchihuitlicue as being related thru marriage. Therefore, it is to be understood that there is a correlation between all three of these deities that would subsist on the most basic and essential element of water and its availability through the seasons. We should take special note of the fact that Chalchihuitlicue serves as the ruler of the day sign of "Coatl," or the Serpent, which holds a high degree of physical similarity with the movement and flow of waters found within the indispensable rivers of ancient history that were a key source of survival and territorial designation for those times. The ancient Teotihuacan version of the water goddess "Chalchihuitlicue," meaning, 'Skirt of Jade'. She was the personification of all water sources in the forms of lakes, rivers, and the oceans as well. In this pictograph mural, she is seen pouring fourth the bounty of the waters, which in them contain life forms such as sea shells, and other beings indicating her status as a bearer and a preserver of all life forms. In her headdress, there is the symbol of the Quetzal Bird, which also bears the fangs of the solar Tlaloc Rain deity. The curious headdress itself is a symbolic pictograph of the Milky Way, which in this case also apparently contain the implications of male sexual organs as symbols of fertility. The goddess herself also wears the "Tlaloc Rain Fangs," as a nose pendant indicting her affiliation to the cult of fertility. The opposite of water is fire, and the direct manifestation of the earthly fire is the upward solar fire or sun, which is the true source of rain and its deliverance. When in coming to terms with the ancient Tlaloc deity, one must go beyond singular definitions of godhead, and instead journey into the realm of the multifaceted manifestations that permeate various monotheistic concepts. In this respect, the ancient Tlaloc is not only the primordial and fecundate earth monster, but it is also the sun that arises out of the bowels of earth at dawn, and that will plunge into the darkness of evening to be finally delivered to the hour of midnight in the form of an owl – the midnight solar bird of darkness. The solar connection of the ancient Tlaloc deity to the owl is obvious, with the trademark goggled eyes that designate this god all throughout Mesoamerican history. The origins of this goggled eyed characteristic are to be found specifically with the Zapotec conceptual rain deity of “Cocijo.” As well, goggled eyed deities are to be found within the Maya realm as well, although usually in more of a subtle form, but nonetheless just as frequently. In short, these goggled eyes, which permeate Mesoamerican iconography could just as well be said to represent the midnight sun. Indeed, the true identity of the ancient Tlaloc deity is the midnight sun, in the form of an owl that finally picks up the water serpent at the midnight hour. Upon rising upward, these two animals merge as one to become a Feathered Serpent, or more specifically the form of a rain cloud. Mural 1: Olmec Cave Rock Painting from Oxtotitlan. These rock paintings that are to be found at the natural rock shelter of "Oxtotitlan," are said to represent the earliest sophisticated paintings of the Mesoamerican culture, and are dated from about 900 BCE to 500 BCE. 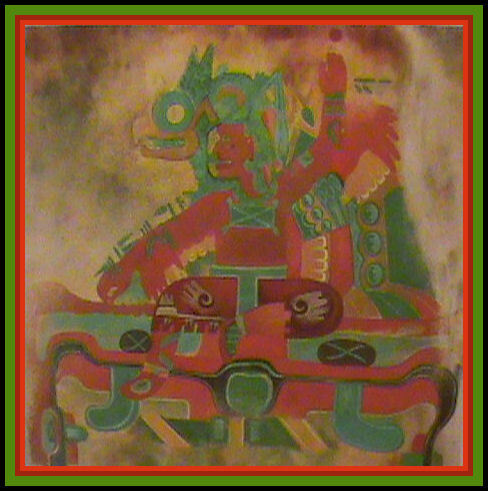 The human figure is clearly regarded as a ruler deity or (Quetzalcoatl) who is wearing the contraption of an Owl Costume, and once again representing here the nature of the precipitation phenomenon in the form of the midnight sun, which is an owl that takes up the water serpent that is found within the resource of the mountains, and the caves. The painting itself is a full sky constellation form, with the double avian seat of the ruler representing the Milky Way. From the mouths of the double avian images seem to hang the formation of water serpents; but also at once the frontal version of the image indicates that this is a serpent head with fangs, and so therefore once again indicating the message of the retrieved Feathered Serpent. The Owl Head to the upper left is the constellation of Ursa Major, while the Red Dot above the rulers hand is the star Arcturus. The backward slash symbols or, "\\ \\" are in all probability the specified direction of the spiral arms of the Andromeda Galaxy as they are seen appearing within the Milky Way Arm. (Interpretation from the author: October 2011). Thus, for that matter the true facial identity of the ancient Tlaloc Serpent Mask is that of an owl picking up a serpent with its beak, only that the owl beak for aesthetic reasons has long ago disappeared from the iconographic record. For that matter, it is also true that the Tlaloc Mask also bears features of the "Midnight Mountain Jaguar," Tepeyollotl, and therefore making this Tlaloc being a mixed combination of owl and jaguar. The fangs of the Tlaloc being indeed are to be understood as elongated drops of rain falling from the bitten 'rain serpent', and in essence representing the serpents blood, which has fallen as a result of being consumed by the midnight owl. However, it could also be added that at least in concept that if this ' midnight sun owl' has indeed arrived to the center of the earth, then in keeping with tradition it has in a sense died there as well. Thus, for having caught the rain serpent at the hour of midnight, the midnight bird has died as well along with the water serpent, and now (at least theoretically) the spirit of both beings will emerge to finally rise from the head of the dead owl (now a Jaguar being) as one entity, in the form of the resplendent and luminous Feathered Milky Way being, which is the true iconographic source of the "Quetzalcoatl Concept" since its initial inception so long ago. With this idea we also become more familiar with Quetzalcoatl's vague iconographic Jaguar affiliation. (From the Author: October 1, 2011). The famous drawing by Alfonso Caso, showing the evolutionary source of the Tlaloc Mask as it stemmed initially from the Olmec sources, and moved simultaneously into the Mayan and Zapotec worlds, and which finally amounted to the Teotihuacan version that would finally become the Mixtec version; which finally became the well outlined and documented "Tlaloc Rain God Mask," of the later Nahuatl speaking Aztec Civilizations. 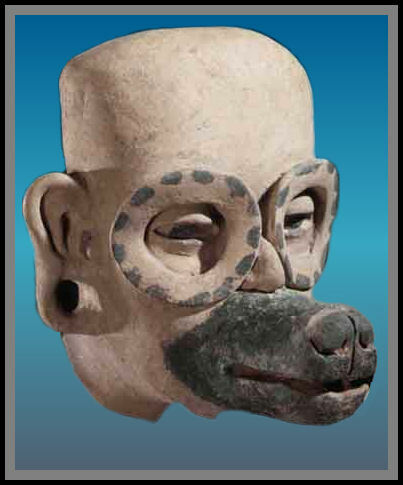 The mask is principally understood as a Jaguar being, however there are also the overriding implications of the "Midnight Owl," aspect indicated by the goggles as a symbol of the midnight sun, which takes part in the seasonal precipitation phenomenon. By applying this intuitive hypothesis variably, we perhaps can now become more acquainted with how the Quetzalcoatl Milky Way being had ever become the symbol of the wind, with the notion that this luminous Milky Way being could indeed be the 'released spirit' of the physical midnight sun, which theoretically had died with the water serpent in its mouth within a heroic act of service towards life and humanity. Of course, the traditional Quetzalcoatl symbol displays the more esteemed and colorful feathers of the Guatemalan Quetzal Bird, and this is perhaps indicative of the difference that is found between the two formulations in the whole process of the resurrection, and diffusion of energy that is finally symbolized with the fecundate, dark-gray bloated rain clouds that vacillate over head. These will bring about the desirable and renewed greenness to the land, thus the implication of the green Quetzal Bird. The Teotihuacan Quetzalcoatl Dragon Maw: A symbol of the Milky Way and the Galactic Center as a source of fertility. Furthermore, it is the luminous conglomeration of the Galactic Center that seems to be billowing from out of the Feathered Milky Way Dragons Maw. This bright luminous center had become the preeminent symbol of wind and rainfall as this constellation center was seen moving across the southern sky's during the summer months when the monsoon rains of Mexico were in their season. In its own way, this massive Dragon constellation form seems to be deliberately showering the earth as it moves across the sky. Many murals at Teotihuacan recall just such an image of the early Quetzalcoatl Milky Way being as the deliverer of rain and the following abundance it produces. Also, for that matter however, it would appear that the Milky Way Dragon would also be responsible for the other more powerful forces of hurricanes which battered the land with destructive winds, and that were in turn greatly feared for having the potential to carry off the populace, just as was said to have happened to the 2nd Sun of "Ehecatl Tonatiuh," as it is seen featured on the face of the Aztec Sunstone. These people of the second creation were said in myth to have been transformed into Monkey's. In this way, the zoological reference of the Monkey then by default becomes an inherit aspect of the Quetzalcoatl concept. Soon after this point in history, it would then seem that the initial fertile aspect of the Milky Way Dragon had disappeared a little further into the background, in order so that the more male oriented element of Ehecatl-Quetzalcoatl, which was positioned as a being that acted as a cultural curator of the arts, and the sciences could then emerge as an archetype for the new growing communities. It is also true that the iconographic representations listed earlier above and beginning as far back with the Olmec may have been representing this man like archetype as well, however it becomes even more prominent later in Mesoamerican history. With this change that was initiated, the priests then began to further construct and advertise a man like entity gifted with the pertinent intellectual skills, and the superhuman prowess that retained some of the earlier supernatural powers of the Milky Way Dragon as being a bearer, and creator of either the constructive or destructive weather conditions that man subsisted on. For that matter, the Milky Way Dragon was retained as the logo of Ehecatl-Quetzalcoatl, but was also reserved as an iconographic eccentricity that recalled the past, and the greatness of the former civilizations from within Mesoamerica's ancient foundations. Quetzalcoatl from the Codex Laud: Here in the form of Ehecatl-Quetzalcoatl, the male human orientated figure inherits the luminous "Dragon Maw Mask" of the Milky Way, although now more specifically it is the eccentric "Buccal Wind Mask," often thought of as the relic of an exotic jungle bird. The actual Feathered Serpent can also dawn this mask as well, for in reality the mask initially came from the earlier dragon source anyway. Also however, the mask can symbolize the stars of Leo, where Quetzalcoatl's royal scepter is to be found as the sun passes along throughout the hurricane season through these and other nearby stars. (From the Author: May 1994). Ehecatl's function found here on the royal Jaguar seat indicates his status as the god of royal lineages, and the foundation of law and order. The above image may contain some of the legacy about Quetzalcoatl as the high priest who attempted to abolish sacrifice in a acculturated mythological concept, but not necessarily as a historical fact, which it is usually pursued as. The concept and source of the Feathered Dragon is more important to the study and comprehension of the deity, as it comes down to us from the confused mythological histories of Mesoamerica. For that matter, the brightness of the nearby Galactic Center to the concept of the Dragon Maw, may in itself just as well indeed create a bridge-link between the significance of the brightness of the planet Venus, and the meaning of Quetzalcoatl as well as being related to stellar light sources. Also deep within the former glory of the Feathered Dragon as a zoological stellar being, and also as a being, which for having been related to the production of weather it was to also have had by default very specific 'solar associations' that were more pronounced with the 'solar Tlaloc war god affiliation' that had denoted the cycles of the sun as the seasonal cause of annual precipitation. Along with the daily, and the yearly cycles of the sun, the cycle of Venus as a companion of the sun on its journey throughout the parameters of space and time had been closely noted long ever since the time of Mesoamerica's beginnings. The connection of the planet Venus to a water and fertility Milky Way Dragon has naturally been lost due to the misappropriation of the stellar cosmologies that once permeated the Mesoamerican psychological landscape. Along with the stellar orientation of the summer solstice sun, we are also to find and discover the most important and brightest star in the sky “Sirius,” shining brightly in the Milky Way Dragons tail near the ecliptic when the sun entered the summer months. Due to the inherit brightness of the star Sirius, and the planet Venus, a simulacrum had been long developed between the two bodies, which could have also hinged on the cycle of the rains found during those summer months when the sun was generally conjunct the star Sirius. With this innate affiliation of the star Sirius and the planet Venus we might finally resurrect a connection between the planet Venus and the cycles of rain that are aptly an integral part of the Quetzalcoatl legacy. Because the brightness of the star Sirius directly opposes the Galactic Center at the opposite end of the Milky Way Dragon, there may indeed be the bases of a long lost concept of death and resurrection of the solar god head at the two ends of the winter and summer solstices. Tlaloc-Mixcoatl-Tlahuizcalpantecutli: In this unique aboriginal representation of the Tlaloc Rain Deity, we can see elements of three different godheads stemming from the rain god, with the ancient hunter associations of the Mixcoatl (Cloud Serpent), which bears the red and white stripes of the 'running blood rain clouds'. For this prevalent aspect, there then is also is a Venus War element that must be acknowledged as well, as we see the deity bearing a shield on his wrist, while he hurls a lighting bolt in the other. The jaw bone deities painted on the vessel also allude to the Venus Warlord principal of this Tlaloc manifestation, which is probably related more specifically to the winter and summer solstice rains. Traditionally, as well the planet Venus had always had associations of war due to its observed cycles falling in conjunction with the various conflicts throughout the land. For this reason, the following archetype of Ehecatl-Quetzalcoatl was to retain certain attributes of battlefield skills that aided the warrior on the battlefield; these were retained in the form of the Venus War lord "Tlahuizcalpantecuhtli." These warrior like aspects of Ehecatl-Quetzalcoatl could even indeed be said to have been initially garnered from the even more ancient deity of "Mixcoatl," a Nahuatl word meaning "Cloud Serpent," that also referred to the Milky Way Dragon. The two mythologies of Quetzalcoatl, and Mixcoatl in fact have so much in common that in one corpse of mythologies, Mixcoatl was said to be the father of Quetzalcoatl under his veneration of the date name of "Ce Acatl," or 1-Reed, which outlined Quetzalcoatl's jurisdiction as the Toltec god of warriors. Here again, Tlahuizcalpantecuhtli would configure heavily within the Quetzalcoatl mythologies, and more specifically we might even conclude that Tlahuizcalpantecuhtli is actually a regenerated derivative of the earlier Mixcoatl aboriginal legacy. Tlahuizcalpantecuhtli: Lord of the House of Dawn, was more likely a derivative of the aboriginal hunter plains deity of Mixcoatl. In this observation, we are more likely to derive a Dragon aspect for the Venus War Lord, which could take on many aspects of the fearful portent that went along with the sight of Venus as both the Morning or Evening Star. Above we see a turquoise back shield made in the image of the god, which encapsulates the four directions. It is being assumed here by this author that the "Bird-Dragon," aspect of the symbol has been extracted specifically from the southern end of the Milky Way as a Double Headed Dragon. The eye of the deity in this case sits in an area where the summer solstice currently resides, there can also be found as well various stellar filaments that resemble an eye; giving new meaning to the concept of "Gem in Eye." The mouth in this case incloses the 1st brightest star Sirius, counterpart of the Venus War Lord, and then curves upward geometrically to surmount the 14th brightest star of Procyon. Orion in this case forms the lower jaw of the Dragon. (Personal Discovery of the Author: 2002). Both the legacy of Mixcoatl as an ancient aboriginal hunter-warrior, and the legacy of the meaning of the 'reed shaft' as an arrow used in the art of the hunt and war may variably and justifiably be related to the star Sirius, and the similar stellar locality of the hunter constellation of Orion. Indeed for that matter, Mixcoatl in the Mesoamerican mythologies was known as a god of the rains, which was demonstrated by the red and white body paintings that signified a rain of blood falling like water from the whiteness of clouds above; and which were also symbolized by way of a simulacrum with the “White Milky Way Cloud Dragon.” Mixcoatl was indeed related though somewhat confusingly along with Quetzalcoatl to the planet Venus, but this can be further confirmed and corroborated with the star Sirius and planet Venus connection. The legacy of Mixcoatl in Mesoamerica, can very much resemble that of Osiris in the ancient Egyptian world as a superintendent of the dead signified by the white road of the Milky Way, the passage way to the underworld. Mixcoatl from the Codex Laud. Here we see Mixcoatl in a classic and repeated image of the god attacking a jaguar, and as a symbol of the Milky Way the cat is bleeding. The cat is seen turning around to claw the organ of the naked aboriginal god - in truth this Codice painting is a star map in reverse. The gods organ is the Andromeda Galaxy, while the jaguars paw is the constellation of Perseus. See star map above. (From the Author: October 2011). Intrinsic to the Quetzalcoatl / Mixcoatl archetypical affiliation garnered through the Milky Way Dragon, and the planet Venus associations, there was to remain as well, the underworld association brought forth from the earlier Mixcoatl blueprint that survived in the newly emerging Quetzalcoatl archetype within the form of his inherit twin deity known as "Xolotl," who is outlined as specifically a god of death, the place of the underworld, and it's inherit dark contraption of the ball game. Within this dualistic two fold mythology between Quetzalcoatl and Xolotl, we then find the appropriation of the two different phases of Venus as a Morning and Evening star as being assigned to each one of these two Quetzalcoatl archetypes. Naturally, as Xolotl was to absorb the more dark and deathly element of the Quetzalcoatl religion, this deity would of course be identified with the Evening Star phase of Venus, which follows the sun into the dark underworld after sunset. Accompanying the sun on it's underworld journey, this deity was aptly to absorb the classic affiliation of the 'dog servant ' companion of the sun through the underworld. The vestiges of Sirius as the "Dog Star," are evident here with the earlier mention of the Sirius / Venus connection that pervades the cyclic nature of the sun, and it's celestial journeys through the encampments of night, and the passageways of the ecliptic throughout the year where the sun once again meets with Sirius for a helical setting in May, and later a helical rising in August. Due to the dual nature of the Quetzalcoatl / Xolotl archetype, the planet Venus with its dual modes of Morning and Evening Star appearances has been the most formally accepted version of the Quetzalcoatl identity. However, this “Venus Archetype,” for the Quetzalcoatl legacy has suffered on certain accounts of iconographic identification since in reality, once again, the true meaning of 'Quetzalcoatl' is indeed the image of the “Feathered Serpent,” while Venus can only fulfill the nature of a serpent form conceptually, and perhaps only as being a 'forerunner' and providing the official path of the sun on its journey throughout the heavens. For this matter, in reality, as we saw earlier the true identity of the Feathered Serpent image should come to be understood as being originally derived from the Milky Way, mean while the location of the star Sirius within the Milky Way Dragons tail could indeed provide some good evidence for the further associations of the planet Venus to the legacy of the Feathered Dragon and its iconographic designations. However, this does not mean that there are not to be other stellar iconographic legacies that are to be related to the Quetzalcoatl archetype as it was exercised throughout Mesoamerican history. Germane to the Quetzalcoatl iconographic legacy is also the scepter that he is often seen carrying, which is called the "xoniquilli," and which is usually seen encrusted with seven stars that have been said to represent the 'little dipper' or Ursa Minor. The specifics of the stellar connection to Quetzalcoatl's scepter have been outlined by various authors (Brundage.1981:85). Yet along with Ursa Minor, the curved constellation of Leo may configure strongly as well in this regard since the scepter held by Quetzalcoatl has implications of royalty. These royal implications are stressed as well by the location of Ursa Major in the sky, which serves as the rotating pivotal center symbolized by the star Polaris. While authors have noted this inherent connection of Ursa Minor, what has not been well noted, or understood is the fact that a stellar representation of Quetzalcoatl is actually holding the royal xoniquilli in the northern sky. (From the Author: June 1986) This formal image of Quetzalcoatl is indeed the stellar body of Perseus as it appears to be standing on the Pleiades star cluster. For this reason, Quetzalcoatl has been referred to as the "god who stands on the marketplace stars." This perception is instructively reinforced with the pointed constellation of Cassiopeia that is seen routinely emerging out of the northeastern sky as a symbol of Quetzalcoatl's pointed "Huaxtec Cap." Quetzalcoatl from the Codex Ramirez, and as is seen in the book "Americas Assignment with Destiny," by Manny P. Hall. Unknown to the general public, and the scholarly community as well, this codice picture actually outlines one of the most important constellation forms in ancient Mesoamerica, which is Quetzalcoatl as the Perseus and Cassiopeia star groups. The Mesoamerican Pleiades symbol are quite evident below this deities foot, and the scepter he bears is also well known and accepted to be the constellation of Ursa Minor. The journey that the Perseus star group makes into the underworld on a daily and seasonal basis provides strong evidence for the legend of Quetzalcoatl's underworld journey to retrieve the bones of man. The constellation form is routinely seen rising in the north-eastern horizon beginning in the summer months at the time of dawn. This is due to the fact that when the sun is at the summer solstice, that it is also apparent that the constellation form seems to be pulling ahead of the sun at dawn, somewhat in the same sense that the planet Venus moves ahead of the sun as the Morning Star. This constellation form also lies within a vicinity of the Milky Way where it would seem that it is darting out like an arrow of light from the vicinity of the star Sirius. (Specific Discovery of the Author: See T.I.M.E. Chapter above for more details pp. 2 and 3). Also Note: That this constellation discovery was the bases and the inspiration of the painting at the top of this page in the header that was created by the author in 1991. There then are the legends of Quetzalcoatl as the deity that journeys into the underworld to retrieve the bones of man. At times he is specifically designated as the god Xolotl in this case. As usual, we are perhaps to retrieve the usual planetary Venus archetype to understand this occupation of the legendary Ehecatl-Quetzalcoatl here as the redeemer of man. However, due to the periodic rising's and falling of the Perseus constellation, we might actually have the bases of the myth that sends Quetzalcoatl into the underworld to retrieve the bones of man, and where he then confronts the Lord of the Dead (Mictlantecuhtli) who tests and challenges Quetzalcoatl before finally tripping him as he tries to flee from the underworld with the bones of man. Quetzalcoatl having been tripped by the Lord of the Dead, then accidentally drops the bones of man, which shatters the bones into numerous pieces. Having been evaded of the Perseus connection of the Quetzalcoatl legacy, we have not yet been able to retrieve the possibility concerning the whereabouts of the broken bones of man. However, in truth, the Pleiades star cluster has been referred to as many things throughout history. In Mesoamerica, they could be thought of as a hand full of seeds, but always they were thought of pertaining to the concept of 'many' parts due to their numerous bright appearance. For that matter, one of their current Nahuatl names is known as “Miactin,” meaning 'many'. Although far from the usual deliverance of narrative information, the facts nonetheless could point to the Pleiades as being the dropped and shattered bones of man. Bones were indeed thought of as the 'seeds' of life that were rejuvenated by the labors of Quetzalcoatl. (From the Author: September 23, 2010). This particular stellar constellation of Quetzalcoatl may have been important to the Xochicalco New Fire Ceremony, which reopened the new 52-year cycle with the date of 2-Serpent. The assumption here would be that the old 52-year cycle was closed with the date of 1-Lizard, which is related to the constellation of Perseus by virtue of the angle that this constellation rises in, and which is found in the north-eastern direction where the 4th sign of the Lizard or (Cuetzpallin) is situated within the 20-day horizontal compass. If this 52-year New Fire Ceremony reopening had taken place on the date of 2-Serpent, in the year of 1-Rabbit, then the date of observance would have been around October 20th. This may have meant that this particular version of the rite was taken care of nearer to the dawn, and as well it is the speculation of this author that it may have involved the situation of the Andromeda Galaxy with respect to the Pleiades, since both stars are located within the Perseus stellar complex. In fact, interestingly, the smaller portion of the Andromeda Galaxy seems to be the expelled breath of this Perseus-Quetzalcoatl constellation as it relates to the star group of Cassiopeia. (See page 10 of the "New Fire Ceremony," chapter found above). Of course, as is well known, the name of this 4th sign of the 20-day cycle in the Mayan version is called "KAN," and specifically refers to 'ripe corn'. The legacy of the Quetzalcoatl archetype revolves around the rejuvenation of mankind through resurrecting the bones of man from the underworld. Alternatively, Quetzalcoatl is said to have resurrected the corn seed from the same location as well, and then was to mix the two with his own blood to create the new version of man. For the matter of the Mayan day sign, this Perseus star group buried in the middle of the Milky Way Arm indeed can resemble a corn plant as it 'sprouts' from the north eastern horizon. On the subject of the origin of the Quetzalcoatl mythology, some would prefer to believe that the earlier Mayan mythology of Hun Nal Ye was to be the precursor to the Ehecatl-Quetzalcoatl concept. However, in reality, there are many elements of iconography that displace such a narrowed view point that assigns the origins of Quetzalcoatl specifically to Hun Nal Ye. For one thing, there never was any specific association of Hun Nal Ye, to the Milky Way Dragon. Nor was there ever any association of Hun Nal Ye to the wind or the rain. Only does this most precise association come through with the death and resurrection of the corn god from the underworld, and the occupation of the 'twins' who execute this duty, and who only resemble Quetzalcoatl and Xolotl in concept. For that matter, the reality of the situation is that Hun Nal Ye is more aptly related to the Flayed God of Springtime, Xipe Totec. In truth, this ancient horrific deity is actually the true counterpart to Quetzalcoatl in his more humanoid archetypical form. Indeed, the Perseus star group is also related to Xipe Totec as well. As can be seen in various iconographical representations, both gods wear the conical "Huaxtec Cap," which is variably related to the Cassiopeia star group. Also, both deities of Xipe, and Ehecatl-Quetzalcoatl have the characteristic stripe down the eye and through the cheek. This is firstly an aspect of the Xolotl Dog, and the Huehue Coyotl concept that was then projected upon these two deities by virtue of the stellar location of the Andromeda Galaxy and its barred spiral arm. (From the Author: 2002). The buccal nose mask seen above and so indicative to Ehecatl-Quetzalcoatl is borrowed over from the area of the Galactic Center as an initial aspect of the "Feathered Milky Way Dragon," which was then placed upon the more humanoid Quetzalcoatl archetype. Xipe Totec from the Codex Laud: Here he is seen as the god of spring, and attending to the planting care of the young corn deity, who is subject to interference from animals and birds. This gods Metztli, which took place in the spring of late February and early March, was also relevant to the placement of the sun within and around the constellations of Perseus and Cassiopeia. Therefore, Xipe Totec's 2nd Metztli is indispensable in recognizing that the 18-periods of the year in the Aztec Calendar are not part of a slip cycle, but instead are fixed by virtue of the correction procedure held in every 52-years when the Pleiades reached the zenith at midnight in the year 2-Reed on the day 4-Movement. The relative relationship of Xipe Totec, and Quetzalcoatl is reinforced and yet suppressed all at once, with the location of the spring rites of the second 20-day Metztli of "Tlacaxipeualiztli," and finally the 3rd and 4th Metztli's of "Tozoztontli," and "Huey Tozoztli," the Small and Great Feasts of "Vigilance," implying 'penance'. Xipe and Quetzalcoatl are the two gods of penance and sacrifice, except that Quetzalcoatl had become the god of self-sacrifice and penance. This idea is recognized and put forward in the 40-day period of Tozoztli, but strangely these two 20-day Metztli cycles found in late March and April are not ruled by him. It is the supposition of this author that possibly these two Metztli cycles were at one time perhaps related to Quetzalcoatl in other cultures, but were to have been later suppressed by the Mexica-Azteca. If this is by any chance the case, then it is no wonder that Quetzalcoatl has no official rulership of any of the 20-day Metztli cycles found in the later Mexica-Azteca religions. The first smaller feast was officially ruled by the earth goddess Coatlique, while the great feast was ruled by the corn god "Centeotl," and "Chicome Coatl," or 7-Serpent; two deities which are variably Quetzalcoatl affiliations. It is also worth noting as well that these two ceremonies took place, and still occur when the sun is within a relative vicinity to the Perseus constellation complex. The 3rd and 4th Metztli cycles of Tozoztontli, and Hue Tozoztli: "The Lesser and Greater Vigil's" that were celebrated in late March, and through the latter part of April, were specifically dedicated to the gods of the spring and the blossoming of the earth with flowers and agriculture. The first cycle was ruled by the earth goddess Coatlique (Serpent Skirt), while second greater cycle was ruled by Centeotl, and Chicome Coatl (7-Serpent), and who are both agricultural deities of the of corn growing ritual. Above it can be seen that both cycles have been represented by a stellar constellation represented by a bird being pierced by a bone. These two diagrams, which are both from Diego Duran's "Ancient Calendar," specifically show elements of the spring blossoming as part of the environmental scenario. According to Duran, as it was mentioned by him in his manuscript, this stellar formation was thought to be specifically the stars of "Taurus," and while this idea may be subject to further debate we can still be assured that this is nonetheless a spring ceremony when the sun is approaching the Hades Star Cluster in any case. In the opinion of this author, rather it would seem instead that the bird iconography is not so precise in this case, and that instead the light of the Andromeda Galaxy would represent the bone thrusted into the image of an outstretched bird that is the full extent of the Milky Way. When this is taken into consideration, it can be seen where the constellation form would correspond perfectly with the solar time of year when the sun is just within the vicinity of the Andromeda Galaxy. Other than that the Gemini / Orion / Taurus star groups would be setting in the west at sunset during this time of year. (See star map under page 5 above). As the theory is generally accepted, Topiltzin Quetzalcoatl as a legendary and/or mythological ruler was to have undergone a certain historical expulsion from his empire between 923 and 947 CE. The evidence for such a divine human legacy in Mesoamerica is actually, though not surprisingly very sparse. The uniqueness of a semi-divine ruler has permeated high culture ever since the dawn of major civilizations, and was used to serve as a bases of edict for their ruling classes. The consequences have always naturally resulted in the negative circumstances, or of failure for the semi-divine ruler, who for having succumbed to their own human nature had become derailed by typical community sins. With this natural inclination of the semi-divine ruler as being part human in the first place, a role model was being provided to remind the earthly human rulers of their own mortality, and potential for personal ruin through negligence, and lack of religious vigilance. The myth of Topiltzin Quetzalcoatl is no different in this respect, and for that matter there were many historical rulers and priests who were given the name, title, and role of "Quetzalcoatl." It is very unfortunate that the general public who briefly peers into the mysteries of ancient Mesoamerica, must become forever sidetracked by relating every aspect of the Feathered Serpent symbolism to the legend of the mythical ruler for the city of "Tollan," which means the 'Place of Reeds' by the archetypical lake of the community of: In Atl, In Tepetl: The place of 'the water, and the mountain', which served as the celestial foundation of the human home and community on earth. For that matter, there were to be many Tollans as well, found throughout the land of ancient Mexico, both in concept and in name. Of course, it was the natural reaction of the natives to focus the mythological reputation of a conceptual community history onto their own past and cultural record, in order to serve as a bases for their own social engineering. Topiltzin Quetzalcoatl from the Florentine Codex: After the Spanish Conquest Bernadino de Rivera (Sahagun) had written a volume on the myth of Topiltzin (Our Prince) Quetzalcoatl, as advised through native informants. However, despite the implied legitimacy of the former rulers legacy, in truth each and every aspect of this 'deities' regalia is a result of stellar iconography: The Pointed Crown, the Curved Staff, the Shelled Earing, the Striped Cheek, and even the pose of letting blood from the shins is of a stellar origin. The Shield? Therefore, what aspect of this 'deity' is actually human? Deep within the reservoir of the symbolic language of mythology, and the stellar format from which it is derived, there remains the potential within the development of so many gods arriving from the heavens to finally embody a 'flesh and blood presence' about them. This is demanded by the community at large, who would demand that their gods should be as real as they feel they are. For this task of being real, there is also the command that these 'super-humans' should also rule them as well. The concept of a celestial emissary has haunted the imagination of man for as long as the concept has been needed to relieve the hardship of political rivalry, and social confusion in a world ruled at large by humans. In the case of Topiltzin Quetzalcoatl, the legacy of his implied rulership centers around the abolishment of human sacrifice throughout the land, and pointing therefore to the controversial need to do so in Mesoamerica. In place of the old edict, the divine ruler only demanded that there should be the sacrifice of butterfly's, snakes, birds, and other animals, as offerings to the gods. As an aspect of social legitimacy, the offering of one's own blood was the center piece of the royal edict, which then became part of the essential symbolism repeated within the iconographic legacy associated with the divine ruler. As earlier mentioned above, this may have been part and parcel of the spring rites of "Tozoztontli," and "Hue Tozoztli," the Small and Great Vigil, which took place after the rites of Xipe Totec. However, for the mythological reputation associated with Quetzalcoatl as being anti-human sacrifice, the later Mexica-Azteca may have suppressed this aspect of the deities affiliation with those ceremonies. Nonetheless, this spring ceremony affiliation might have been principally recognized in places sacred to the Quetzalcoatl mythology, such as in the ancient city of Cholula, (circa 100-1521 CE) where the largest pyramid in Mesoamerica now stands; and where in truth the original edict for the abolishment of human sacrifice may have actually ever arrived from, if it indeed is true. The city of Cholula was an eventual mecca point for the authority of kings who had arrived there from throughout the land to receive royal legitimacy born from out of the Quetzalcoatl concept. However, royal lineage was a legacy of Mesoamerica in whole since its beginning, therefore there is no need to associate the bases of the royal lineage with the mythological legacy of Topitzin Quetzalcoatl. Rather instead, the Feathered Serpent concept had gained this aspect of social hegemony, for the very element of reliability and stability that the Feathered Serpent had portended as a good omen pertaining to a generous rainfall, and the blossoming of vegetation that came about as a result. Quetzalcoatl was the myth of plenty, and the promise of fulfillment found in a structured world of divine order. For this reason, his early mythology related heavily to the needs of man for the bases of rain, and the abundant foods it produced. Quetzalcoatl, the Feathered Serpent was therefore the god of universal generosity, and an advocate for the survival of man as being apart of his very spirit as the movement of the winds. Naturally, as a part of the overall Milky Way serpent legacy, the virtual image of man was to be found there in the heavens as well. The suggestion has been earlier given by default, with the explanation of so many deities arriving out of the heavens in the basic form of man with his serpent like body, and other serpent like extensions to aid him in the environment. Therefore, the Feathered Dragon had early on in Mesoamerica, had become the god of man both in physical form, and therefore in religious resolution. In Mesoamerica, the 5-fold star created by the 584-day journey of Venus upon the ecliptic may have been a symbol of man's body, although admitting as well that there is no official word of this found in any codices. Nonetheless, most anything associated with man was associated with Quetzalcoatl as the Feathered Dragon in Mesoamerica; and that included both man's life at birth, and as well as his death. For this reason when we see the image of a man arriving out of the jaws of a Feathered Dragon in Mesoamerica, we do not necessarily see the image of Topiltzin Quetzalcoatl as an ancient king, but rather our own image as a divine mortal of periodic reawakening's.